Former first lady Laura Bush speaks at a forum sponsored by the George W. Bush Institute in New York, Thursday, Oct. 19, 2017. 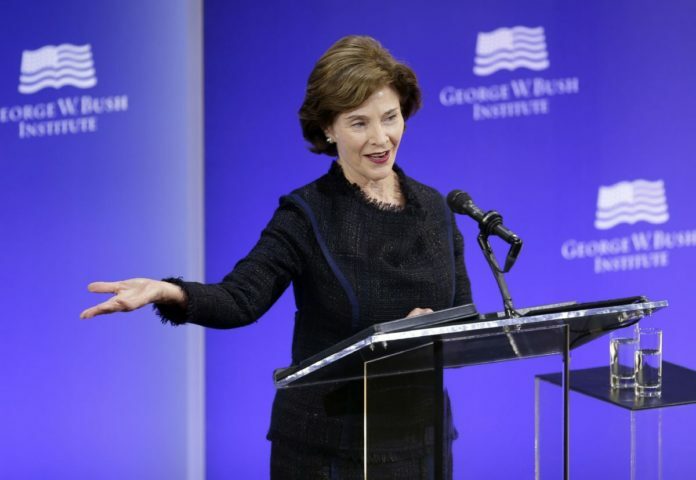 McALLEN — Former first lady Laura Bush will be in McAllen on Nov. 8. Bush, 70, wife of former President George W. Bush, and a former Texas governor, will be participating in an event at Quinta Mazatlán, according to an invitation. The Lower Rio Grande Valley Learning Landscapes is hosting the invite-only luncheon. The LRGVLL works with school districts to create gardens and native plants on school campuses throughout South Texas. The group has partnered with Texan by Nature, which is an organization Laura Bush founded that works to conserve natural resources. LRGVLL recently partnered with Texan by Nature for the creation of native habitats as learning centers as part of a multi-school district initiative in South Texas. The mission of LRGVLL works to engage students, teachers and administrators to integrate native gardens. These gardens help attract butterflies, birds and other wildlife to the area to positively impact local ecosystems. School gardens have launched and will continue to under the partnership. Laura Bush was a strong advocate for education and literacy during her husband’s presidency, and has continued those efforts as a former first lady.